Do you want to know more about Scooter and Wheelchair Rental at Disney World? 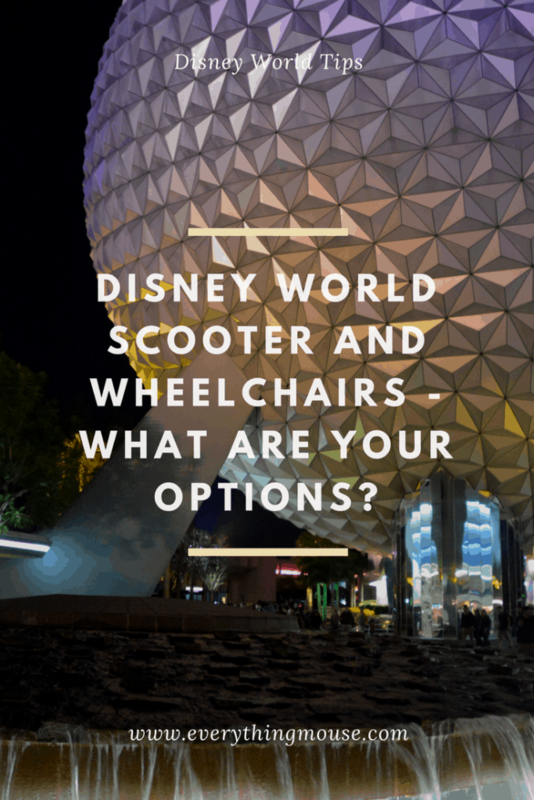 If you have mobility issues then you may be thinking about renting a scooter or a wheelchair for your Disney World vacation. There is a lot of walking involved in all of the Disney parks, particularly in Epcot park. You may be thinking that a scooter rental at Disney World is the best option for you. Wheelchairs and Electric Convenience Vehicles (or scooters as they are often called) are available for rent at all of the Disney World parks, including the water parks and Disney Springs. There are a limited number of wheelchair rentals available at the Disney resort hotels. How Much are Scooters and Wheelchairs to Rent at Disney World? 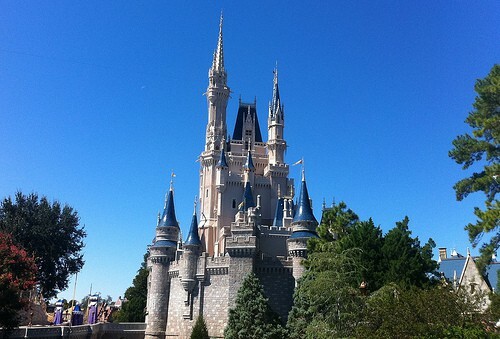 Wheelchairs are $12 per day to rent at Disney World. You can also get a discount on wheelchair rental if you buy the multi day option. This takes the price down to $10 a day. The multi day discount is not available for Water Parks or at Disney Springs. No deposit is required in the parks, but a $100 refundable security deposit is required for wheelchair rentals at Disney Springs and the Disney Water Parks. If you know that you are going to need a wheelchair for more than one day then you should consider getting a length of stay ticket. This also gets you to an expedited line at the Disney parks. Wheelchairs (not scooters) are also available from the Disney resort hotels. There is no charge for this but a $315 security deposit will be held on your credit card. If the wheelchair is returned this will be refunded to you. These rentals cannot be guaranteed so if it is essential that you need a wheelchair it may be advisable to contact a third party company to rent one for your stay. If you want to rent an ECV or scooter at any of the Disney parks then the cost is $50 per day at the parks and Downtown Disney. A $20 refundable deposit is required for scooters in the parks, and a $100 refundable deposit at Disney Springs and the Disney Water Parks. You must be at least 18 years of age to rent a scooter. The weight limit is 450 lbs for a scooter. Will There Be A Scooter or Wheelchair Available to Rent? The scooters are very popular and you do need to get to the parks early in the morning or you do run the considerable risk that they will not have any left to rent. Wheelchairs are usually available but the scooters supply often does not meet the demand. If it is essential that you need a wheelchair or scooter for your visit you may want to think about renting from an outside company. The outside rental companies generally offer considerable savings and will deliver the scooter to your hotel or vacation home. You do need to consider the difficulties of transporting the scooter so you need to talk to the rental company about this. The East side of the entrance plaza at Epcot. This is on the left just before you reach Space Ship Earth. There is another rental station at the International Gateway entrance. Available at Garden Gate Gifts at the entrance to the Animal Kingdom. Located to the right just past the entrance at Oscar’s Super Service. Replacement wheelchairs only are available in the Character Costume Shop. There are rental locations at Blizzard Beach, Typhoon Lagoon and Disney Springs. How Do You Get From The Parking Lot? Disney World does provide courtesy wheelchairs in all of the theme park parking lots which you can use for transport from your car to the theme park entrance. In our experience these are often difficult to find in the parking lots! If you have a Disability Parking Permit then for all the parks the parking lot is as close to the entrance as it can be. There may be courtesy wheelchairs in this location but as we said, that is not always the case. It can be a problem in Magic Kingdom as the parking lot, even the Disability one is a fair distance from the Transport and Ticket Center. This parking lot does not have a tram stop. For this reason it may be a good idea to rent from an outside source if you are visiting Magic Kingdom and cannot walk very far. As an alternative you may be better off parking in the usual parking lot as you could then take a tram to the entrance. The reactions that you get from other members of the public when using a wheelchair or scooter may be difficult sometimes. We recently had to rent a wheelchair for a number of days for my teenage daughter when visiting the parks. Usually you can see her dancing on pointe as she is a ballerina who trains for 6 days a week and is extremely fit. However she had a knee injury and was told to avoid putting too much weight on the knee for a week. As this was in the middle of our vacation I saw no choice but to rent a wheelchair for her so as to avoid making the injury worse. It was an enlightening experience. We used the wheelchair to transport her around as much as possible and certainly never used it to ‘skip the lines’. Even when it was offered we stood in the regular line. But the looks that we all got were sometimes very difficult to comprehend. Unfortunately some groups of teenagers do use the wheelchair rental to game the system and skip the rides. I guess that is why we got those looks of disapproval. Scooter rental brings it’s own difficulties! They are apparently pretty easy to learn to drive but make sure that you are comfortable with what you are doing. The Disney World monorail brings it’s own problems. The Cast Member will help you with a ramp to get on and off the monorail. However, I have on a number of occasions seen guests who are having real difficulties reversing out of the door. This would be a reason to rent in the parks if you know that you are going to be using the monorail system a lot. So just be aware of the rates and advantages of scooter rentals inside and outside the parks so that you can make the best decision for your Disney World vacation.